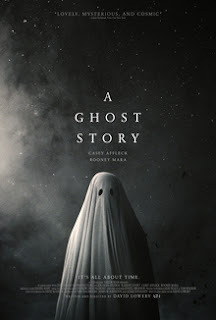 A Ghost Story manages a delicate balance of poignancy and humour. It's premise and execution are inherently silly but it is handled so sweetly, so deftly, that once can't help but embrace it. The only difficulty I had with it is its varying pacing issues. At times the film felt it was stuck and other times rushed. Loss, connection, legacy. So much is explored in this rather intimate and focused story of a man after death. Unlike the traditional way of telling similar stories, think Ghost, there is no McGuffin which needs to be accomplished. Instead film maker David Lowery just lets his subject watch the world move on without him. Its beautiful and simply tragic. The circular story may be a bit on point and most of the time I felt I knew exactly where it was going, but the feelings in it resonated so strongly that it felt more confirming than "predictable." But what truly makes A Ghost Story work is Lowrey's deftness. He keeps his story hyperfocused on narrow details. This works as a device since the film seems to be exploring isolation but also works in keeping us invested in this story. But there are times I felt he got too focused. Lowrey chooses a few scenes to draw out, almost endlessly. Was he trying to create a feeling of timelessness, of being stuck? I'm not sure but I know it did pull me out of the film. Watching Rooney Mara eat a pie, angrily, for what felt like half the film, was jarring. Other parts of the story would feel like we were skipping around without time to get a real feel for what's going on. Yet over all the story pulls us back in until the beautifully cryptic ending which ends up being far more satisfying than one would expect. A Ghost Story will haunt you and I guess that's really what it's trying to do.